Come see why we have an Award winning Sales and Service Departments, “You just can’t beat an Adams Chevrolet Deal”. 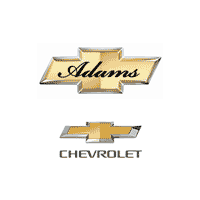 Adams Chevrolet Certified Guarantee…A complete 160 point inspection performed on all certified pre-owned vehicles, plus a free vehicle history report. Comfortable waiting area with free Wi-Fi access. Certified Staff in Sales and Service…Our staff goes through a rigorous training process that exceeds all GM standards.